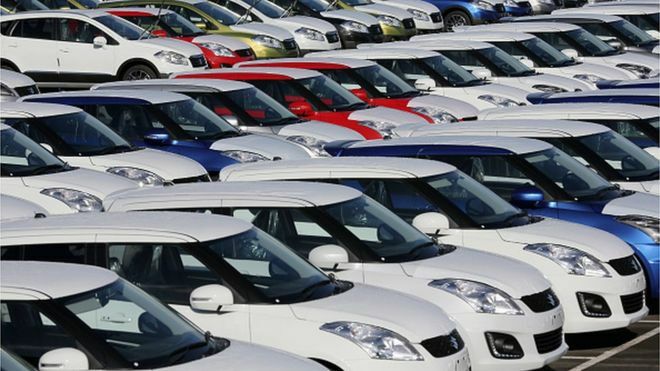 Car manufacturing in the UK fell last year for the first time since 2009.According to new figures from the Society of Motor Manufacturers and Traders (SMMT), 1.67 million cars left UK factories in 2017, a decline of 3% compared with the year before. The SMMT says lower demand from UK consumers was the main reason for the fall, although exports also dipped. New investment in the UK motor industry shrank as well, falling to £1.1bn last year, compared with £1.66bn in 2016. Despite the decline last year, manufacturing in the UK remains high by historical standards, having risen steadily in the aftermath of the financial crisis. The number of cars that rolled off the production lines in 2017 was still the second highest since the turn of the century.But the SMMT remains concerned about the effects of falling business and consumer confidence, as well as what it calls confusion over the government’s policy on diesel.Output for the domestic market fell by 9.8%, reflecting a decline in new car sales, which gathered pace towards the end of the year. 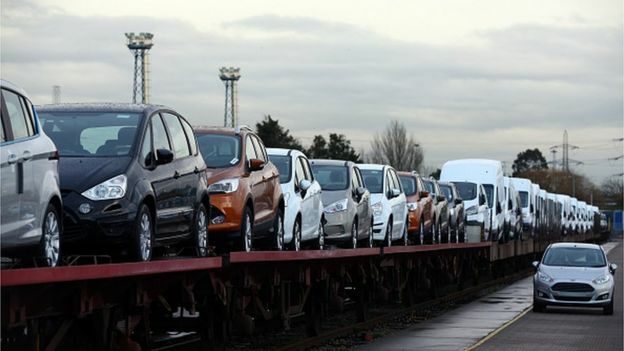 Overseas demand continued to dominate production, with almost eight in every 10 cars built being sent abroad, more than half of them to the rest of the European Union.Meanwhile demand for commercial vehicles in the UK fell by 25%, which the SMMT blamed on “a fall in business confidence and fluctuating buying cycles”. However, exports to the EU fell by just over 5%. Despite big increases in demand from other markets, notably Japan, China, Canada and the United States, overall exports fell by 1.1%. Export volumes do tend to fluctuate from year to year, and the arrival of a new model can have a big impact on the figures. However, the SMMT is clearly worried that future exports could be under threat, if rapid progress is not made on the trading conditions which will apply after the country leaves the EU. It argues that there is an urgent need for agreement on a transition deal, allowing the UK to remain in both the single market and the customs union until a final agreement on a new trading relationship has been reached. In addition, it wants the UK to continue to benefit from existing EU free trade agreements and customs union agreements during the transition, to protect exports to countries such as South Korea, Canada and Turkey.”We urgently need clarity on the transitional arrangements”, the SMMT chief executive Mike Hawes told reporters. Such arrangements, he said, “must retain all the current benefits, else around 10% of our exports could be threatened overnight”. The SMMT has also released figures showing that investment in the UK automotive sector fell by a third last year, dropping to £1.1bn from £1.66bn in 2016 and £2.5bn the year before that. Although investment in the motor industry is often cyclical, and can vary sharply from year to year, the SMMT says there is evidence that it is now actually stalling, as companies wait for certainty over our future relationship with the EU. It says rapid progress is needed on trade discussions, to safeguard jobs and promote future growth. Despite the overall fall in production, meanwhile, one segment of the market is currently expanding. Engine production grew by 6.9% in 2017, with 1 million diesel units and 1.7 million petrol units being built. The SMMT attributes much of the recent growth to investment in factories producing the latest generation of high-tech diesel engines – such as Ford’s plant in Dagenham, which alone builds 790,000 units each year. It is an important sector, employing some 8,000 people, with nearly half of them working on building diesels. But whether the growth can be maintained is open to question. 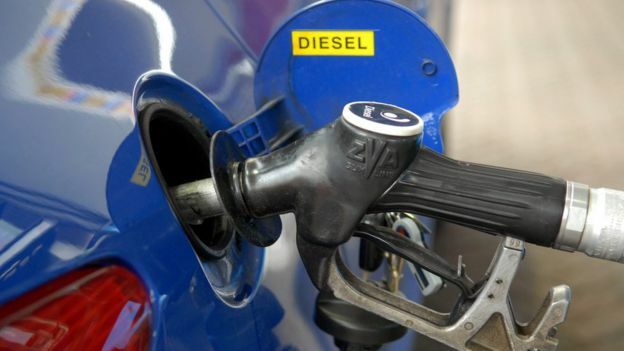 In the UK, diesel sales fell by more than 17% last year. Across Europe, too, diesel’s market share has been falling, as politicians have become more concerned about urban air quality – and consumers have become worried in turn about possible restrictions on using their cars. People within the industry insist that modern diesels are clean. But they admit that persuading enough people to buy them is proving to be a challenge.